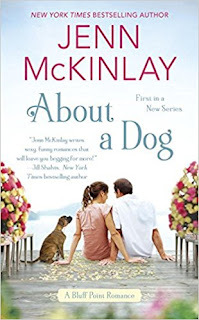 First off, I never read any of Jenn McKinlay’s books and romance books aren’t exactly a favorite of mine, though I do enjoying the good ones from time to time. Ms. MicKinlay has gained a new fan. This is a cute, warm and funny story you’ll be sure to remember. If not for the characters but for a stray puppy Gavin rescues and is named Tulip. I enjoyed this cute romance novel with a twist of puppy love in it. Back home for two weeks as maid of honor in her best friend Emma's wedding. Emma just happen to be the older sister to Gavin, with whom Mac has a bit of a secret. I love the setting on the Maine coast, one of my favorite places to visit, despite the cold. The characters are well developed and the story has several plot twists. I confess to not being a big fan of romance, but those that I enjoy, I truly do so and have no hesitation in recommending. Such is the case with About a Dog. I enjoyed the friendship, camaraderie, humor, the aunts, and of course, the stray pup named Tulip! If you don’t love anything else about this book, you can’t help but fall in love with Tulip, the stray dog. Disclaimer: Thanks to First to Read for the opportunity to read and review. I received a copy of this book in exchange for a fair and honest review. 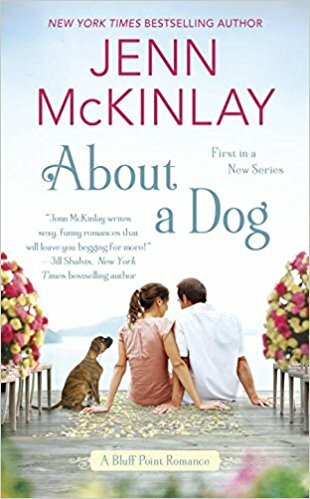 Former librarian and New York Times and USA Today bestselling author Jenn McKinlay is the author of About a Dog, as well as the Library Lover’s Mysteries, the Cupcake Bakery Mysteries, and the Hat Shop Mysteries. Jenn lives in sunny Arizona in a house that is overrun with kids, pets, and her husband’s guitar.